On January 11th, I awoke to what I THOUGHT was a typical day here at the jungle. It was far from that I was later to discover, and my patience would be put to the test. With all the bad media hype on exotic animals my nightmare had only just began.. but this soon unfolded into God’s miracle! I heard the alarms go off so I stepped outside to see a Wild life officer standing outside the compound area. I walked over and he greeted me in his usual cheerful manner.. but you could see the look in his eye was one of worry and anxiety. He asked me, ” Have you lost anything?” Well, as any zoo keeper knows this is a question you DO NOT want to hear! So I mulled through my mind WHAT if ANYTHING COULD have gotten out. Birds? Nope, Snakes? Nope, Monkeys? Nope and the inventory rapidly went through my mind before I gave a resounding NO. He ASKS AGAIN! Now I am WORRIED! What the heck have they found they think is ours?! I said NO, never ONCE thinking into the inventory the big cat listing as I well know how many we have and I had just fed them all. I told him NO again and then asked WHY. He stated that they were some grainy photo’s from a hunting camera that some people thought was either a bobcat or a TIGER. Now let me have you ponder this. Tigers are NOT native to this area. We are not open to the general public as of yet, but we have given private, guided tours. AND I must say, I have my share of haters, that do not like me for me as I do speak what is on my mind. I do make sure I do NOT pass on gossip though. So if a Tiger is not a native, what other reason would a tiger be even considered in this grainy shot that FWC can be quoted as saying “identifying Big Foot would be easier” unless it was to throw the heat onto us here at Mystic Jungle. The officer did a physical walk through and head count. Of course all were present and accounted for. Thus the rumor mill began amping up to full speed ahead. The rumor went as far as Massachusetts. The next thing I know the two grainy blurred picture was posted in the local paper and mass hysteria began. Grab your children and guns, !!! Mob mentality began. I bit my tongue and held my peace answering all the phone calls trying to alleviate the panic and fear of the population. To no avail. We even offered the Sheriff’s office as well as the land owner to come out with a tracker and a tranquilizer gun to help track down this mystical beast and was told NO with a resounding chord! They could find not paw prints and we offered to allow them to come out and see what a real live tiger paw print would look like. That was ignored. At this point it appeared that all anyone was interested in was causing panic, causing undue harm to us and the residents of Mystic Jungle, thus endangering MANY lives here! I was as I said, very patient and answered any and all questions aimed at us. It was only after I got a surge of new friend requests on Face Book that I realized something was up. I asked one such new friend to give me a little about herself and that is when she informed me that I was the topic on the in line news report of our local paper and it was stated that I was a GAME FARM. She was infuriated, and had friended me to check us out and was pleasantly surprised that we are not. THAT is when I came out swinging. I have NEVER nor will I EVER sell an animal to be killed! 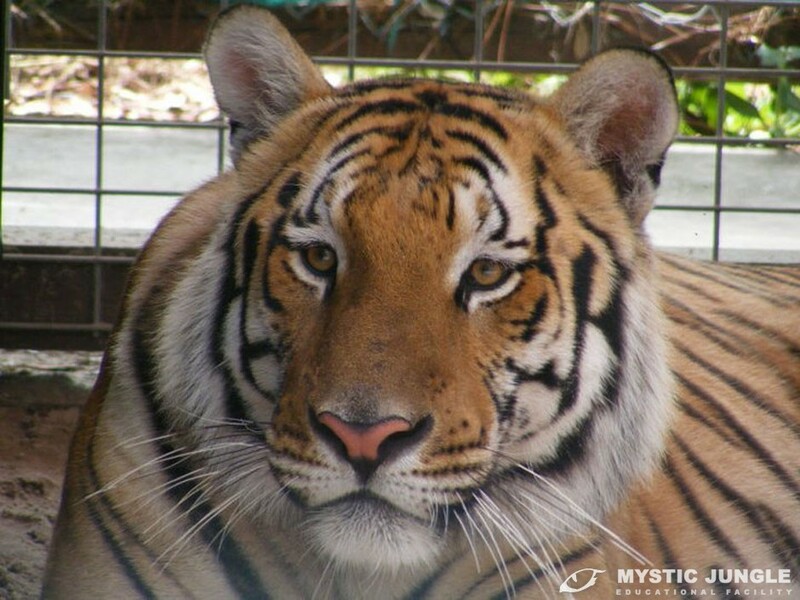 Mystic Jungle is here to aid in the conservation and preservation of endangered and threatened species. Well, I wrote a letter to the editor and asked him to retract that wording. Instead he asked if they could come out for an interview. I reluctantly agreed. Understand that 98% of the time a zoo, private owner or exhibitor is interviewed, the reporter does a spin on it (I assume because it makes more rating in the aftermath of Fatal Attractions or the Ohio Incident) but sucked it up and agreed. The woman that arrived was indeed cheerful and you could see that she was a true animal lover. She recorded me and my husband for later notes, took some great shots and what come on the tail end of it is a blessing from our Creator. He and He alone turned what could have been a disaster, even though we had done NOTHING wrong, into a positive thing.